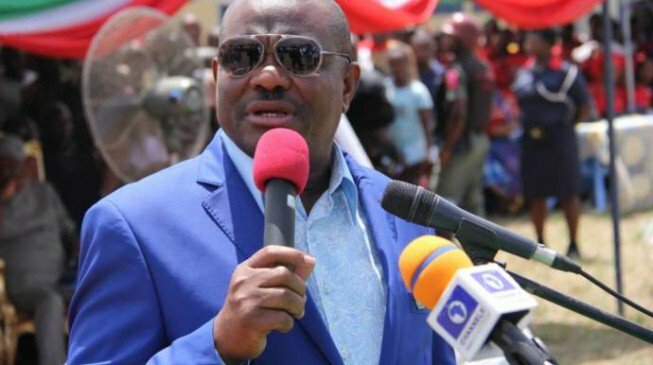 Wike said this on Friday when the newly-constructed governor’s office in Ado-Ekiti, Ekiti state, was inaugurated. He said while Ayodele Fayose, governor of the state — from the PDP — had meager resources at his disposal, he was able to deliver important projects to the people of the state. “We are happy to be part of PDP states commissioning key projects unlike the APC states where wheel barrows, hired tractors and bags of mangoes are commissioned,” he said. In 2017, Samuel Ortom, governor of Benue state, was said to have donated wheel barrows to youth in the state as part of his empowerment programme. Wike said Fayose has performed well because “he believes in massive development in line with the PDP manifesto”. The governor accused the federal government of “deceiving” Nigerians with “lies” in the form of change mantra. He said the country is “sliding into anarchy” and urged citizens to vote against the APC during the 2019 general election. “Jonathan knows what democracy is all about. He never used his power to imprison the opposition. He never allowed anyone to shed blood for political gains. That is not the case today,” he said.